April 10th, 2018. On the 26th episode of Weekly Bites Z, Doctor O showed off a Single Rare and our first Triple Rare of the new format, from V-BT01: UNITE! TEAM Q4!, the grade 1 Pongal and grade 2 High Dog Breeder Akane. AUTO: When placed, if there is another unit in the same column as this unit, you may Soulcharge 1. If you soulcharge a Trigger Unit, this unit gets Power +5000 until end of turn. A promotional version of Pongal is being distributed to the winners of Standard-format weekly shop tournaments in Japan this May. This version features alternate artwork in the style of an Origin Rare, using the original illustration from Pongal's debut in BT02: Onslaught of Dragon Souls. Pongal being 027 in the setlist puts him right after Knight of Rose, Morgana, the current Japanese Card of the Day. AUTO [Vanguard/Rearguard Circles]: When placed, you may [Counterblast 1] to search for up to 1 "Pongal" from your deck, call it to a Rearguard Circle, and shuffle your deck. CONT [Vanguard/Rearguard Circles]: During the battle it is boosted by a High Beast, this unit gets Power +3000. 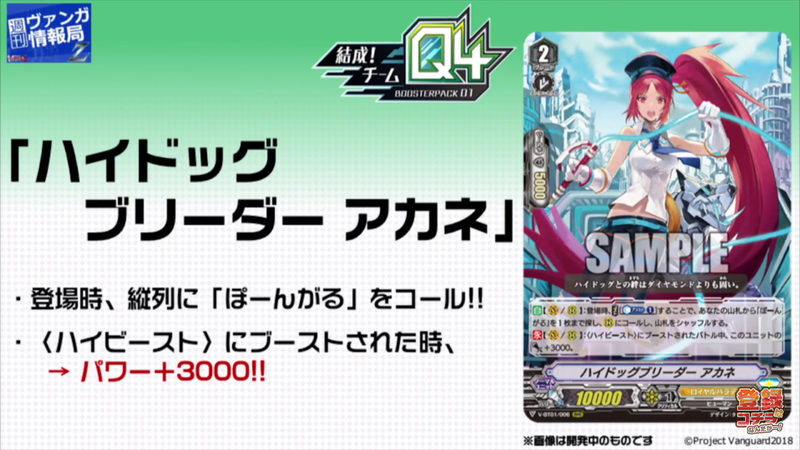 The new set is confirmed to contain 4 Vanguard Rare and 8 Triple Rare cards, with Akane's numbering confirming her as one of at least two Triple Rare cards for Royals. Right now the easy assumption to make is that each of the four clans in UNITE! TEAM Q4! 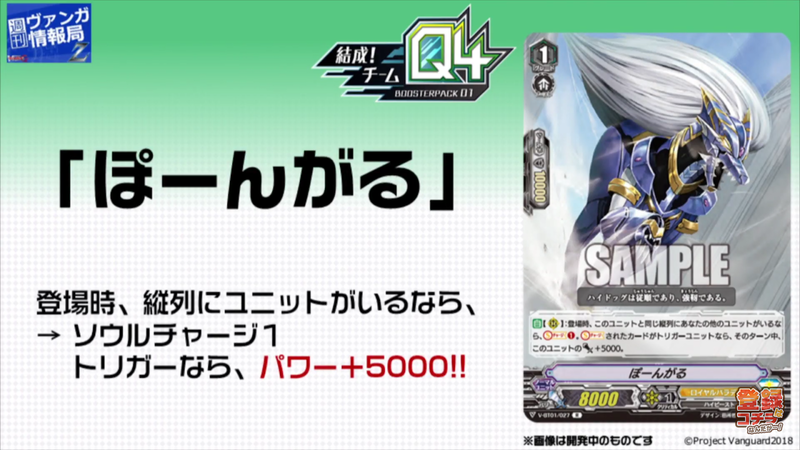 will get at least one Vanguard Rare, with Royal Paladin's being the cover card of the set, the King of Knights Alfred. The RRR before her can only be a grade 2 or 3 based on the set's numbering; although no cards have referred to her by name, many believe it to be Soul Saver Dragon based on Aichi's heavy usage of her in the manga. 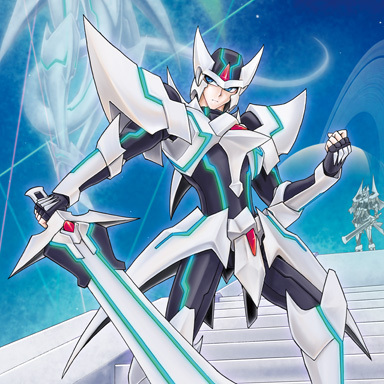 On the other hand, Itou Akira's illustration for Blaster Blade shows what appears to be Thing Saver Dragon nearby. "Let's ride! To a new Vanguard!" V-Booster Set 01: UNITE! TEAM Q4! will launch in Japan May 25th, 2018, and in English June 22nd, 2018. 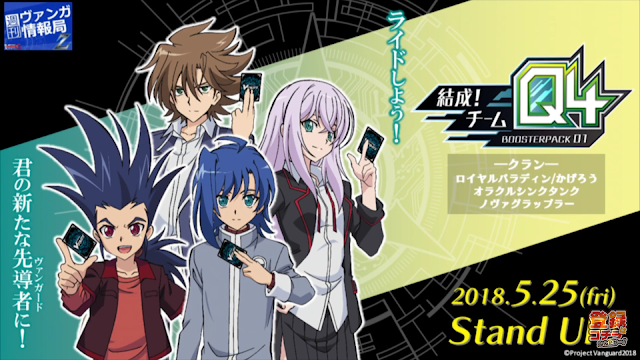 It will be preceded by the first Trial Decks of the new format, V-TD 01: Sendou Aichi and V-TD 02: Kai Toshiki, launching in Japanese May 11th, 2018, and in English June 8th, 2018. They will be accompanied by a new sleeve based on the "Imaginary Gift" design. The first Extra Booster set, V-EB01: The Destructive Roar will launch in Japan June 29th, 2018, and in July for the English-speaking world. The accompanying new anime series, codenamed "Origin," will begin airing May 5th, 2018, on TV Tokyo and affiliated stations. It will be simulcast with English subtitles on YouTube and Crunchyroll.